Tobacco production is a multi-billion-dollar global industry. Unfortunately, the cultivation of tobacco engages the labor of children throughout the world in extremely dangerous environments, which has both immediate and long-term consequences for children and society. This paper explores the human rights concerns associated with child labor in tobacco production by highlighting three countries—the United States, Kazakhstan, and Malawi—and examines the impact that the United Nations Convention on the Rights of the Child, the International Labour Organization’s (ILO) Worst Forms of Child Labour Convention, and the ILO’s Safety and Health in Agriculture Convention have on child labor practices in tobacco production. It also proposes general actions to address the human rights concerns related to child labor practices in tobacco production, as well as specific actions for selected countries. A human rights-based approach to reducing child labor in agriculture could create meaningful changes that improve lives and opportunities for health, education, and economic stability among children and families across the globe. Tobacco production and consumption are public health issues with human rights implications.3 Global tobacco giants, through a complex supply system, engage the labor of children throughout the world in extremely dangerous environments, which has both immediate and long-term consequences for the children being employed and for society. This paper explores the human rights concerns associated with child labor in tobacco production by reviewing three countries—the United States, Kazakhstan, and Malawi—which were chosen as examples that highlight different levels of human and economic development. It also examines the impact that the United Nations Convention on the Rights of the Child (CRC), the International Labour Organization’s (ILO) Worst Forms of Child Labour Convention (C-182), and the ILO’s Safety and Health in Agriculture Convention (C-184) have on child labor practices in tobacco production. It concludes by proposing actions to address the human rights concerns related to child labor practices in tobacco production. Although this article focuses specifically on child labor in tobacco production, the human rights-based solutions discussed have crosscutting implications for child labor throughout the agricultural industry. Tobacco is an agricultural commodity product. Up until the 1960s, the United States dominated global tobacco production; however, now China, Brazil, and India lead the United States.14 Much of US tobacco production has been outsourced to the developing world.15 In fact, tobacco is now produced in 125 countries, including Argentina, Guatemala, Indonesia, Italy, Kenya, Pakistan, Poland, Thailand, Turkey, and Zimbabwe.16 In a quest to lower production costs and increase shareholder value, multinational companies move into less regulated countries, where they negotiate extremely low prices that often result in debt servitude or the producers’ use of child labor. 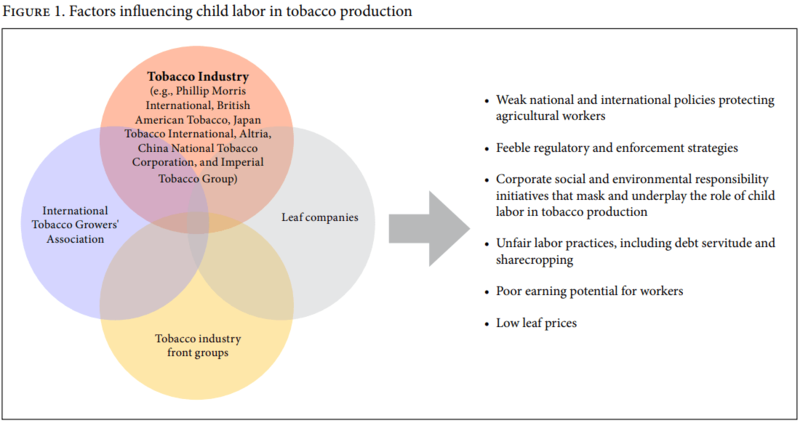 Sharecropping is also commonly used as a mechanism to gain access to cheaper labor and to transfer the risk from landowners to workers.17 Tobacco companies benefit from these unfair labor practices.18 Figure 1 highlights the confluence of factors that influence child labor in tobacco production. The circles in the figure overlap to signify the collusion between the tobacco industry and their front groups, leaf companies, and the International Tobacco Growers’ Association. There are several reasons for the lack of accurate data on the number of children working in tobacco production. These include children working as unpaid family members, underreporting, and a lack of labor law enforcement. Additional research is needed to more precisely estimate the number of child farmworkers in tobacco production across the world. In early 2015, the US Department of Labor released recommendations developed by the Occupational Safety and Health Administration and the National Institute for Occupational Safety and Health that specified the personal protective equipment—such as long-sleeve shirts, long pants, gloves, and water-resistant clothing—that should be utilized when handling tobacco leaves; however, the document did not mention the use of child labor in the production process. It is clear that the US government is not adequately protecting child tobacco farmworkers nor upholding its responsibilities under various international standards. Tobacco production labor practices have significant implications for human rights, specifically the right to equality, the right to health, and the rights of children. Child labor on tobacco farms must be framed as part of the human rights agenda. This section examines three international treaties to assess their positions on child labor and their effectiveness in eliminating the practice. With 196 parties, the CRC is the most universally ratified human rights convention in the world; the United States is the only country that has not ratified it.52 Although the United States has not ratified the CRC, it has signed it, thereby requiring the country to refrain from engaging in practices that undermine and defeat the objective and purpose of the convention. Numerous studies have documented that children working on tobacco farms are exploited and work in hazardous conditions that may interfere with their health, education, and well-being. It is time for states parties to act to protect these children by passing effective national legislation to abolish child labor in tobacco production and ensure that all organizations and individuals within their boundaries do not violate the rights of children as outlined in the CRC, including the rights to health, education, and relaxation and play. Without such action, states parties are liable for the breach of human rights obligations under international law. When child labor in tobacco production is examined through a human rights lens, it is clearly wrong and violates the rights of children. Child farmworkers should not be treated as a mere means to financial gain. Employers are receiving a financial benefit from using child farmworkers; however, families and society are paying the price for these actions in terms of lost potential and negative health, social, and educational outcomes. All children deserve to be treated with dignity and respect. Current tobacco production processes pose a risk to workers’ health, especially the health of child farmworkers, and as a result it is a violation of international law for children to be working in these conditions. Child labor in tobacco production is an enduring global dilemma that needs to be resolved from a human rights perspective. Governments have a responsibility to protect their citizens and fulfill their obligations under international human rights law, but politics and the tobacco industry’s lobbying efforts have had a large influence on tobacco control policy around the world. These efforts have allowed the tobacco industry to evade accountability for their actions. Even though human rights advocacy has been found to raise awareness, a comprehensive multisectoral strategy using a rights-based approach is needed to fully eliminate child labor. Below is a list of recommended actions grouped by sector. A number of strategies could be used to address child labor through international law. At a minimum, current international treaty obligations should be enforced. There should also be a standardization of what constitutes “hazardous” work under C-182. Tobacco production should be listed as hazardous given the plethora of science that shows the serious health consequences—both acute and long term—of working with tobacco. Reporting on child labor in tobacco production should be integrated into the Universal Periodic Review process for countries reporting before the United Nations Human Rights Council. This process provides “the opportunity for each State to declare what actions they have taken to improve the human rights situations in their countries and to fulfil their human rights obligations.”68 In addition, increased civil society monitoring of child labor on tobacco farms and the incorporation of these results into shadow reports for the CRC and C-182 could help raise awareness of this issue. Indeed, tobacco control issues have already been included in shadow reports for the Convention on the Elimination of Discrimination against Women and the CRC.69 Many useful tools have also been developed to help civil society participate in human rights monitoring and reporting. Reduce dependence on tobacco. Fostering more awareness on the link between child labor, tobacco, and food security is necessary. Tobacco quickly depletes land’s productive potential.73 Helping farmers find alternative livelihoods through crop diversification and access to supportive social policies could help in the transition away from tobacco production. For example, accessible credit systems could be created for farmers so that they can afford to grow different crops, invest in appropriate equipment, and borrow at reasonable interest rates. Reward education. Research has demonstrated that poverty is both a cause and a consequence of child labor across the world. Child labor creates and maintains the cycle of poverty.74 As a global society, we should change social norms on child labor so that the long-term economic and social benefits of education outweigh the short-term financial payment of work. Rewarding families that send their children to school rather than to work may provide an incentive for education, especially in low-income and middle-income countries. Children have the right to education, and primary education should be universal. Extra fees for uniforms, books, and supplies or a lack of transportation should not be impediments to youth being able to attend school. Collaborative solutions between international actors, national governments, educational districts, and other interested partners should explore how this could be achieved as part of the United Nations Sustainable Development Goals. Create parity under labor law. There should be equitable protection under the law for all farmworkers. Children should never work in hazardous environments, and children working in agriculture should have the same protections as children working in other industries. Therefore, legal changes may be needed to address and remedy the inequities that currently exist under national labor laws. Mainstream child labor into existing legal enforcement structures in all countries. Current national child labor laws should be enforced. Often, enforcement authorities are underfunded and lack appropriate resources to fully complete their responsibilities. Ensuring appropriate funding and staffing for these positions is imperative. Additionally, making child labor a mainstream issue globally would help increase awareness about child labor and promote enforcement. Support and strengthen farmworker labor organizing initiatives. Throughout history, labor unions have helped rebalance the power structures between employers and employees, especially within the agricultural industry. Unions such as the United Farm Workers and the Farm Labor Organizing Committee of the AFL-CIO have consistently fought for workers’ rights. Unions could be a powerful mechanism for reducing child labor by raising such issues as part of the hiring processes or through the grievance-arbitration procedures set forth in collective bargaining agreements. Already, several thousand tobacco workers in North Carolina have joined the Farm Labor Organizing Committee.76 This type of strategy could be especially powerful in the developing world in countries such as Malawi, where there is an active union organizing effort. Collaborate with other civil society groups. Farmworkers represent one of the most marginalized populations in the world, and addressing the issues they face requires multisector collaboration. A human rights-based approach may help build partnerships to address these critical issues. Farmworker advocates could establish coalitions and collaborations with other civil society groups such as those that focus on marginalized populations—including children, women, and indigenous groups—in order to foster awareness of human rights and human rights abuses, as well as develop a joint agenda for action. Some ideas for collaborative action include an international media campaign highlighting “a day in the life of a child tobacco farmworker” or product-labeling certificates that demonstrate that no child labor was used to produce the product.79 These types of activities could increase awareness of the human rights abuses occurring within tobacco production. Pay living wages. Workers have a right to fair employment and to a standard of living adequate for the health and well-being of themselves and their families. Workers should not be compensated merely at minimum wage, which in many places is barely enough to survive. Instead, they should be paid a “living wage” that allows them to earn enough to maintain a decent standard of living. Specific recommendations are proposed in Table 2 for each of the three countries highlighted previously. Child labor is a violation of children’s human rights. Responsible parties such as employers, parents, governments, and international and national actors should be held accountable for child labor in tobacco production. A comprehensive rights-based approach to reducing child labor in agriculture is needed to create meaningful changes that improve the lives and opportunities for health, education, and economic stability among children and families across the globe. Farmworkers are an almost invisible population, hidden from the view of consumers and much of the world; however, they are essential to the global agricultural industry. In order to create a sustainable future, more attention must be paid to the plight of all farmworkers, especially children. Without this focus, this group of people will continue to be the invisible underclass, perpetuating the cycle of poverty. Farmworkers, although producing commodity products, are not and should not be considered commodities themselves. Upholding child tobacco farmworkers’ human rights is vital, and tolerating child exploitation in tobacco production is no longer an acceptable option. Special thanks to Mark Small, Antonia Correa, and Natalia Trinidad for their early review of this manuscript. Athena Ramos, PhD, MBA, MS, CPM, is an assistant professor in the Department of Health Promotion, Center for Reducing Health Dis­parities at the University of Nebraska Medical Center, Omaha, NE, USA, and a faculty fellow with the Rural Futures Institute at the University of Nebraska. Please address correspondence Athena Ramos. Email: aramos@unmc.edu. Copyright © 2018 Ramos. This is an open access article distributed under the terms of the Creative Commons Attribution Non-Commercial License (http://creativecommons.org/licenses/by-nc/3.0/), which permits unrestricted noncommercial use, distribution, and reproduction in any medium, provided the original author and source are credited. N. Lecours, G. E. G. Almeida, J. M. Abdallah, and T. E. Novotny, “Environmental health impacts of tobacco farming: A review of the literature,” Tobacco Control 21 (2012), pp. 191–196. Tobacco Atlas, Manufacturing (2018). Available at https://tobaccoatlas.org/topic/manufacturing. World Health Organization, Tobacco and the rights of the child (Geneva: World Health Organization, 2001). SafeWork, International Labour Office, Safety and health in agriculture (Geneva: International Labour Office, 2000). Centers for Disease Control and Prevention, National Institute for Occupational Safety and Health (June 2014). Available at http://www.cdc.gov/niosh/topics/aginjury. M. E. Miller, “Historical background of the child labor regulations: Strengths and limitations of the agricultural hazardous occupations orders,” Journal of Agromedicine 17 (2012), pp. 163–185. B. Marlenga, R. L. Berg, J. G. Linneman, et al., “Changing the child labor laws for agriculture: Impact on injury,” American Journal of Public Health 97/2 (2007), pp. 276–282. Convention on the Rights of the Child, G.A. Res. 44/25 (1989). International Labour Organization, What is child labour? (2015). Available at http://www.ilo.org/ipec/facts/lang–en/index.htm. International Labour Organization, Child labour. Available at https://www.ilo.org/global/topics/child-labour/lang–en/index.htmipec/documents/publication/wcms_221513.pdf. Z. F. Arat, “Child labor as a human rights issues: Its causes, aggravating policies, and alternative proposals,” Human Rights Quarterly 24/1 (2002), pp. 177–204. World Health Organization, Tobacco industry interference with tobacco control (Geneva: World Health Organization, 2008). Food and Agriculture Organization of the United Nations, Tobacco production quantities by country, Average 1993–2013 (2015). Available at http://faostat3.fao.org. Lecours et al. (see note 1). World Health Organization, Growing tobacco (2016). Available at http://www.who.int/tobacco/en/atlas16.pdf. D. Lisboa Riquinho and E. Azevdo Hennington, “Health, environment, and working conditions in tobacco cultivation: A review of the literature,” Ciència e Saúde Coletiva 17/6 (2012), pp. 1587–1600. M. Otañez and S. A. Glantz, “Social responsibility in tobacco production? Tobacco companies’ use of green supply chains to obscure the real costs of tobacco farming,” Tobacco Control 20/6 (2011), pp. 403–411. Human Rights Watch, Tobacco’s hidden children: Hazardous child labor in the United States tobacco farming (New York: Human Rights Watch, 2014). N. Doytch, N. Thelen, and R. U. Mendoza, “The impact of FDI on child labor: Insights from an empirical analysis of sectoral FDI data and case studies,” Children and Youth Services Review 47 (2014), pp. 157–167. T. A. Arcury, P. J. Laurienti, J. W. Talton, et al., “Urinary cotinine levels among Latino tobacco farmworkers in North Carolina compared to Latinos not employed in agriculture,” Nicotine and Tobacco Research (2015), pp. 1–9. Human Rights Watch (2014, see note 19). US Department of Labor, “Child labor requirements in agricultural occupations under the Fair Labor Standards Act,” Child Labor Bulletin 102 (2016). Available at https://www.dol.gov/whd/regs/compliance/childlabor102.pdf. Marlenga et al. (see note 7). New York Times Editorial Board, “A ban on child labor in tobacco fields,” New York Times (December 28, 2014). Available at http://www.nytimes.com/2014/12/29/opinion/a-ban-on-child-labor-in-tobacco-fields.html?_r=0. United Nations Development Programme, 2015 Human development statistical tables. Available at http://hdr.undp.org/en/data. J. J. Amon, J. Buchanan, J. Cohen, and J. Kippenberg, “Child labor and environmental health: Government obligations and human rights,” International Journal of Pediatrics (2012), pp. 1–8. A. E. Kramer, “Philip Morris is said to benefit from child labor,” New York Times (July 14, 2010). Available at http://www.nytimes.com/2010/07/14/business/global/14smoke.html?_r=0. Phillip Morris International, Agricultural labor practices, progress report 2013 (2014). Available at https://www.pmi.com/resources/docs/default-source/pmi-sustainability/alp-progress-report-2013.pdf?sfvrsn=f402b0b5_0. Amon et al. (see note 31). US Department of Labor, Child labor and forced labor reports: Kazakhstan (2016). Available at https://www.dol.gov/agencies/ilab/resources/reports/child-labor/kazakhstan. M. Otañez, A. Lambert, and R. Sandramu, “Reducing big tobacco’s control in agriculture” (2012). Available at http://www.laborrights.org/sites/default/files/publications-and-resources/Tobacco%20Position%20Paper.pdf. S. Baradaran and S. Barclay, “Fair trade and child labor,” Colombia Human Rights Law Review 43/1 (2011), pp. 1–63. “Research busts exploitation of tenants in Malawi tobacco estates: CFSC calls for labour law,” Nyasa Times (2015). Available at http://www.nyasatimes.com/2015/05/19/research-busts-exploitation-of-tenants-in-malawi-tobacco-estates-cfsc-calls-for-labour-law. US Department of Labor, Child labor and forced labor reports, Malawi (2016). Available at https://www.dol.gov/agencies/ilab/resources/reports/child-labor/malawi. O. De Schutter, Report of the Special Rapporteur on the right to food, UN Doc. A/HRC/25/57/Add.1 (2014). Unfair Tobacco, UN calls for tenancy labour bill in Malawi (2013). Available at https://www.unfairtobacco.org/en/meldungen/un-fordert-pachtarbeitsgesetz-in-malawi. “Research busts exploitation of tenants in Malawi tobacco estates: CFSC calls for labour law” (see note 38). M. C. Kulik, S. Aguinaga Bialous, S. Munthali, and W. Max, “Tobacco growing and the sustainable development goals, Malawi,” Bulletin of the World Health Organization 95 (2017), pp. 362–367. Otañez and Glantz (see note 18); US Department of Labor (2016, see note 39). S. Boseley, “The children working the tobacco fields: ‘I wanted to be a nurse’,” Guardian (2018). Available at https://www.theguardian.com/world/ng-interactive/2018/jun/25/tobacco-industry-child-labour-malawi-special-report. This section draws extensively from US Department of Labor, Malawi (2016). Available at https://www.dol.gov/agencies/ilab/resources/reports/child-labor/malawi. L. M’bwana, “CFSC caution on Malawi gvt’s readiness with tenancy bill for fear of empty promises,” Maravi Post (June 13, 2015). Available at http://www.maravipost.com/national/malawi-news/district/9021-cfsc-caution-on-malawi-gvt-s-readiness-with-tenancy-bill-for-fear-of-empty-promises.html. Human Rights Watch, S. tobacco giant’s move could reduce child labor (November 5, 2014). Available at https://www.hrw.org/news/2014/11/05/us-tobacco-giants-move-could-reduce-child-labor. British American Tobacco, Sustainable tobacco programme. Available at http://www.bat.com/srtp. This section draws extensively on Otañez and Glantz (see note 18). International Labour Organization, Worst Forms of Child Labour Convention (No. 182). (1999). International Labour Organization, Ratifications of C182 – Worst Forms of Child Labour Convention, 1999 (No. 182). Available at http://www.ilo.org/dyn/normlex/en/f?p=1000:11300:0::NO:11300:P11300_INSTRUMENT_ID:312327. M. Wurth, “Tobacco’s children: Brazil sets an example for the U.S.,” Progressive (November 3, 2015). Available at http://www.progressive.org/news/2015/11/188387/magazine-tobacco%E2%80%99s-children-brazil-sets-example-us. International Labour Organization, Safety and Health in Agriculture Convention (No. 184) (2016). International Labour Organization, Ratifications of C-184 – Safety and Health in Agriculture Convention, 2001 (No. 184). Available at http://www.ilo.org/dyn/normlex/en/f?p=1000:11300:0::NO:11300:P11300_INSTRUMENT_ID:312329. World Bank, Agribusiness rules lag in agriculture dependent countries (January 28, 2016). Available at http://www.worldbank.org/en/news/press-release/2016/01/28/agribusiness-rules-lag-in-agriculture-dependent-countries. C. Dresler, H. Lando, N. Schneider, and H. Sehgal, “Human rights-based approach to tobacco control,” Tobacco Control 21 (2012), pp. 208–211. P. Hunt, A. E. Yamin, and F. Bustreo, “Making the case: What is the evidence of impact of applying human-rights based approaches to health?” Health and Human Rights Journal 2/17 (2015), pp. 1–9. R. Thomas, S. Kuruvilla, R. Hinton, et al., “Assessing the impact of a human rights-based approach across a spectrum of change for women’s, children’s, and adolescents’ health,” Health and Human Rights Journal 2/17 (2015), pp. 11–20. Office of the United Nations High Commissioner for Human Rights, Universal Periodic Review (2015). Available at http://www.ohchr.org/EN/HRBodies/UPR/Pages/UPRMain.aspx. R. A. Daynard, R. S. De Alwis, and M. Gottlieb, “International tobacco control: human rights-based approaches,” Public Health Advocacy Institute, Northeastern University School of Law (2009). Ibid. ; Hunt et al. (see note 66). World Health Organization, Parties to the WHO Framework Convention on Tobacco Control (February 2015). Available at http://www.who.int/fctc/signatories_parties/en. Dresler et al. (see note 65). Daynard et al. (see note 69). K. Basu and Z. Tzannatos, “The global child labor problem: What do we know and what can we do?” World Bank Economic Review 17/2 (2003), pp. 147–173. Lisboa Riquinho and Azevdo Hennington (see note 17). Farm Labor Organizing Committee, Conditions in the fields. Available at http://www.floc.com/wordpress/reynolds-campaign/conditions-in-the-fields. A. K. Ramos, “A human rights-based approach to farmworker health: An overarching framework to address the social determinants of health.” Journal of Agromedicine 23/1 (2018), pp. 25–31. Baradaran and Barclay (see note 37). US Department of Labor (2016, see note 35); US Department of Labor (2016, see note 39).